This year, however, one of my New Year’s resolutions is to start waking up early again–before the kids. And not even just 15 minutes early, but a whole two hours early! Before you question my sanity (more than I already am! ), at least hear out my reasons. They’re pretty good ones. And hopefully they’ll inspire you to get out of bed earlier too. 1. So You Can Start Your Day Intentionally. When you wait to wake up until after your kids are up, you start the day in reactive mode. In other words, you aren’t intentionally choosing what you want and need to do; you’re just reacting to the things going on around you. You’re running around putting out fires. By waking up a little earlier, you can start your day proactively and intentionally. You choose what time you will wake up, how your morning will go and what will get done. When you start your day with intention, it’s up to you. 2. So You Can Have Some Quiet Time. I don’t know about you, but I NEED quiet time to myself in order to maintain my sanity. And with two very rambunctious little boys underfoot, quiet time is usually pretty hard to come by. If you need quiet time too, in the morning before everyone wakes up is the perfect time to get it. Enjoy a cup of coffee, read a book, use the bathroom by yourself–the world is your oyster! 3. So You Can Get Stuff Done. How frustrating is it to clean the house, only to turn around five seconds later and have everything destroyed? Even the smallest tasks take way longer than they should when you have to redo them time and time again or when you have to stop every few minutes to take care of the kids. Clean in the morning, however, and you’ll be amazed at how quickly you can breeze through your chores. And then, you only have routine maintenance to worry about during the day. 4. So You Can Enjoy an Un-Rushed Morning with Your Children. Whether you work outside or inside the home, it’s really easy for mornings to become rushed and chaotic. Thankfully, they don’t have to be. 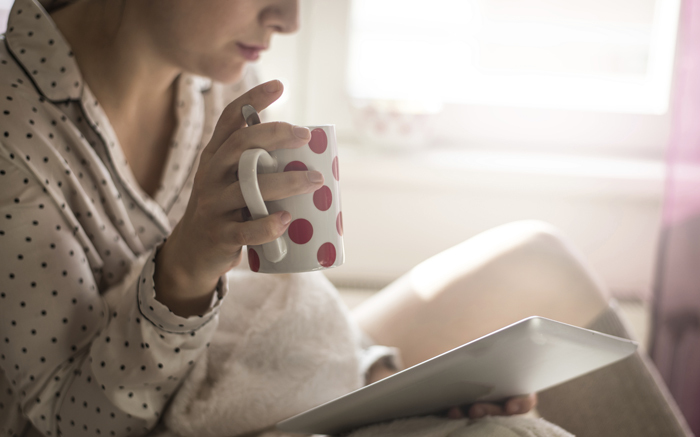 When you wake up early, start your day intentionally, and get your housework out of the way, you can enjoy a more peaceful and laid back morning with your family. You aren’t dragging people out of bed at the last minute, you aren’t scrambling for lost items and you aren’t trying to do a million things at once. Everything is ready to go, and you get to sit down and enjoy breakfast with your children. I stared a free Happy Morning Challenge – check it out! I would love to wake up before my daughter, probably not 2 hours before but 1/2 hour to an hour before would be great. Unfortunately, she wakes up as soon as I am up. Trying to wake up earlier only leads her to wake up earlier and then I have to deal with a cranky kid all day. On good days I can go down the stairs and have a pee before she gets up. I love those days. Yeah, a 4am wake up doesn’t sound too great, does it? That’s been happening to me a lot too lately! I really have to tip-toe to the other side of the house. While I absolutely LOVE this idea (having 2 energetic young boys myself) my oldest, while an AWESOME sleeper, seems to have impeccable timing for waking up right when I do no matter what. Maybe if we move into a house where they are on the opposite side from us I can accomplish this cuz it sure would be a dream come true! Everything in this article was spot on, from the cleaning to the sanity stealing mornings to the quiet time. All so true and needed! Yeah, mine do too. That’s part of why I HAVE to wake up so much earlier. If I wake up 15 min earlier, they’ll wake up. But if I wake up so early it’s still the middle of the night for them, they are far less likely to wake up. Then, I high-tail it to the other end of the house! I really tried but somehow I am not enough disciplined. I wake up before kids on work days, but can’t on week days which I don’t work. But for sure it would make my day more organized, calmer and me – happier. 2 boys, lots to do…how early is too early?? how early is mad?? I totally agree with you about waking up earlier than the kids. I can get so much more accomplished in the short time before they wake up like shower uninterrupted, housework, etc. Having done a lot in the morning it allows me to enjoy my time with them more too because I have at least felt like I been productive for the day. That gives me more time to play. I have tried to stay up late, but I am just too drained by then so early mornings work best for me. I can’t ever bring myself to stay up late, either. Mornings work out much better! I love waking up before my kids! That hour of time in the morning where I can plan my day, get ready, and relax with a book sets my day up to be a good one! Plus my kids get some mommy time, breakfast, and ready for their day without having to rush. We have 2 girls and we always try to be up before them. It really does make the morning go more smoothly when I have me ready to start the day before I try getting others ready. It doesn’t always work–so,ermines my eldest is up bright and early but generally speaking I’m up 30 min to an hour before them. How do I do it? I go to bed early. I’m in bed by 9:30pm every night and up at 5 every morning. One day. I hope it will be a bit later but for now it’s the norm. i do this for ,already for sometime- from Monday to Friday. I am up around 1,5h before my kids (three boys:3y, and twins 1,5). It is amazing to take a shower alone, with a little good music:-) to set up a good mood for a hectic day, put my hair in a good way and drink-still- a warm tea, read a nice quote (preferably ,at least a paragraph, from Paulo Cohello)before a’ to do’ list will start to raise up in my head. When i know i look good and feel good from inside- i am ready for duty with big smile- it is worth it. Most mornings I manage to get up before my little man. Sometimes it is only a few minutes, other times it could be 30 minutes or more. I love that time for all the reasons listed above. And when my little one does wake up before me (or before I am ready), I let him play in his crib for a while before I go in to get him, even if he gets fussy. Every mom knows the difference between an “I’m hurt” cry vs. “I want to be picked up” cry. Nothing wrong with teaching him a little patience, while I prep his breakfast, feed the dogs, and take care of whatever else I need to before letting my mobile monster run loose. It makes for a much happier morning for the both of us. This is an old thread, but I’m so happy I stumbled across your response! I’m usually up before my youngest, but a lot of the time it’s only about 30 minutes, and he ALWAYS wakes up crying. My husband tells me al lithe time that I don’t need to rush in there to get him, he’s not hurt or dying, and he certainly doesn’t think we’ve abandoned him, but I’ve always felt so guilty. I think I’m gonna try it tomorrow morning… finish up without whatever I’m doing and let him fuss and cry for a few minutes to see if he calms himself down. And if he doesn’t, he won’t die 🙊 lol it’s good to know I’m not alone out there. I love this! I get up 2 hours before my 3 boys too. It makes the day flow so much better. Although i don’t clean i study, as a uni student i need as much time as i can get! When my 2 bigger boys go to school i can get some cleaning done. It really makes such a huge difference to that morning routine. I love waking up earlier than my toddler but then I have older children who need my attention the whole day after they are back from school. So I sneak in as much sleep as I can after they had left for school, in the morning, and wake just minutes before my toddler, enough to have my breakfast. This way, there is no rush feeling and I’ve already woken the ‘dead’ me with a cuppa of Joe before the tiny energetic being is up. Wow, that is so sweet! I don’t know what it will be like when we have another child, but right now I have one boy who is 16 months old. He has always been an amazing sleeper. His temperament makes him sound a lot like yours! This was my goal for 2015 to but so far it has failed haha. I find myself getting to bed far too late as it is so I sleep in until after my son has woken me. Not to mention I am pregnant so sleep is important to me now…I know I will reach a point very soon where I won’t get any. Once our second is born, a bit older and they both sleep through the night, maybe I’ll implement this:) I do love all the reasons for doing so though and think they are right on! Unless you have a baby…that changes everything. I started doing this in high school (just getting up 1/2-1hr before the rest of the house), which is how I discovered that I really am a morning person. Right now, however, with my 4.5-month-old still waking me every couple hours to nurse, and waking up for good by 5 or 6… It just doesn’t feel possible. 😛 Hopefully, I will get back there one day. 😉 I really do love the morning time, and being able to watch the sunrise. I so relate to this! My favorite is to have a cup of coffee (or two), do my Bible study, maybe take a quick walk around the block with our 2 dogs if my husband is still home… It’s such a peaceful start to the day — and when the 2-year-old stirs, I feel ready to see him and can walk in with a happy greeting. Thanks for sharing your tips! This year, I’ve been trying to get up before my son to have some coffee & bible time all by myself. As soon as I started doing that, he changed his sleeping habits & now wakes up just minutes after my alarm. (Which I find very frustrating). I was only a morning person when I lived in FL, if it’s still dark outside it takes a lot to get me up! My adjusted goal for this year is to get up even earlier so I can have an hour before my son wakes up. I love this idea. I have considered it before, but your blog has pushed me to ‘put legs on the idea’. I too have a child that has a knack for waking up when I thinks he might consider that it’s possible that I’m awake, but it’s worth a shot. I love my doorstep toddlers more than anything ever, but some mornings, I feel like I wake up to a war zone. I feel like an u trained soldier, too exhausted for battle. I would love to be prepared, both mentally and physically, for my day before they wake. One both of my babies start out in their own beds and migrate to mine during geh night. Sometimes, this could pose a problem with getting up before them. Just like anything else, it may take some time and getting used to on all of our parts, but it would so worth it. Those reasons totally don’t cut it for me. I love my beauty sleep. I like to get my kids in bed earlyish and have an hour to myself for a warm shower and time with hubby. In the day, getting my six year old homeschooler to help with extra chores for pocket money = cleaning rather than messing. I sort of accidentally stumbled on to this gem of advice when I woke up about an hour earlier than normal last weekend! It was so NICE to not be in reactive mode, but to instead get lunch in the crockpot, sit by the window and read some and go through emails and then have lots of time to get ready before I had to start getting a little one ready too! It’s not always easy to pull myself out of bed (I’m a die-hard night owl) but when I do, I’m always glad I did! I totally need to adopt this method.. In fact I try every morning and find the snooze button every time.. ? I have 4 boys. 16,5 and twins 4. Motherhood right!!!!! Gotta love it! I get up at 4:30 to male my drill sergeant husband’s lunch (the only thing he’ll eat in a 16-18 hour day. Rarely, I go back to bed. When I don’t, I get on the treadmill while watching TV shows I don’t allow my kids to watch, shower, do some chores, enjoy my cup of coffee on the porch, and maybe squeeze in another tv show before my girls get up between 8 and 9. I homeschool, so I’m with my kids all day, every dayand that alone time keeps me calm and sane. I do go to bed at the same time my kids do, between 8 and 9 pm, just so I get a full nights sleep in, but usually get a woken up by my husband when he gets home so we can chat for a few mins. I prefer to have my quiet time when all people at home are sleeping in night and I finish my house works in night too. Morning I prefer to sleep, and so my family. I love this article and all the comments, I have a 19 month old little girl who is quite a busy body and waking up before her and getting a few things done really works! It just lets you easy into your day better than to wake up when she wakes up and then everything seems rushed. I completely agree! I used to roll out of bed when the little one woke up crying and I hated waking up to that and just wished I could have 5 more minutes. Now I get up about 45 minutes before her so I can shower and start feeling like a human being before I hear her cries. Amazingly, now her cries don’t bother me and I have the energy to get the day started when she’s awake. It’s worth sacrificing 45 minutes of sleep to start the day intentionally, like you said! 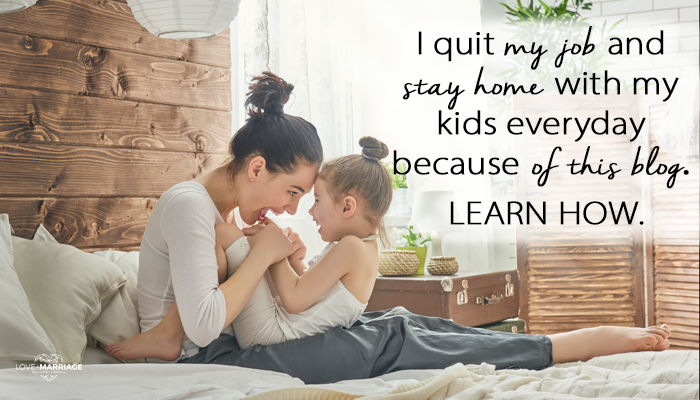 My days do run smoother if I wake up before my kids. I am NOT a morning person though, so it’s a work in progress! I have 2 boys as well and it is so nice when I am in charge of my mornings! Thank you for putting this out there it does inspire me to get up before my boys and have control of the way my day is going to go! Life goes better when you wake up early. I am a farm momma…. So, I’ll share what works best at our house! My 4 yr old wakes up when I do. But, that’s good. I wake up usually around 4-5 a.m. I get chores done while she reads and plays quietly. It’s so wonderful to have all my housework done before the sun comes up. I will also try to get supper ready then too! A casserole or a crockpot meal and clean the kitchen after. Then my day is free to enjoy! Outside chores, playing, gardening, etc…. during the day, I do a quiet time. Try to take a small nap and she can nap or read or watch Winnie the Pooh. On days like this, she goes to bed at 6:30 and I go to bed about 8:30. On days we get up later, ugh… It feels like I’m trying to play catch up all day, and she might not go to sleep til 8:00. Early mornings are great…. You will get everything done in half the time, and let’s face it, who wants to spend more time cleaning than you need to. After she goes to bed, I do a quick pick up, start the dishwasher, and throw a load of laundry in and just let it soak all night. Then turn the washer on in the morning. I highly recommend people get up early. Morning work goes by quicker, smoother, no distractions. And, you will feel so much better thru the day! I have recently started waking up an hour before everyone else. Once school starts it will be 1.5 or 2 hours earlier (depends on if I can force myself up any earlier). I’ve been able to get my devotions and my exercise in, unload the dishwasher and grab a shower before the kiddos and my husband get up which has been great for my sanity. Question though, how early do you get up that you’re able to fit in cleaning your house? That takes me at least 2 hours if I clean first and 2nd floors and skip the basement and there’s no way I could tackle that before the kiddos and my husband are up since the kitchen is usually the room I start in. Great read though – thank you for sharing! The key is an early bed time. Instead of farting around on Facebook for an hour, I make sure to hit the pillow no later than 9 PM. Then, getting up at 5 is really no problem. The family gets up at 615 so I have a solid hour before needing to be reactive. The key is NO wine, NO meals after 6, and NO deviations. A sober, early-to-bed routine will amaze you. How on earth do I wake up before my kids? I got up at 4am and within 2 minutes the kids are awake too. All I want is an hour of solitude before they get up. I wake up before my son every morning and it makes all the difference in the world. Great post. Thank you! This is a very well-written article. The part that will stick with me is identifying mode at I wake up in–reactive—when I wake up after my kids vs. the mode that it is good to be in–proactive. It hits home on in a spiritual context as well–this mistake sets the precedense for corruption and spiritual impurity throughout the day. Ok, thanks for the article and helping me connect the dots for myself.